Draft Express named Indiana’s OG Anunoby and Thomas Bryant as the top two prospects in the Big Ten in the preseason, but there’s a lot of basketball to be played before June’s NBA Draft. 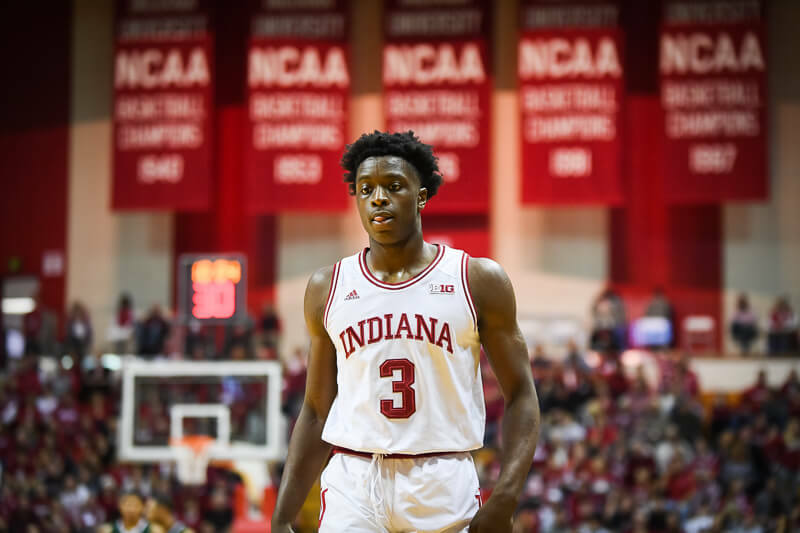 Notes: Anunoby has scored in double figures in five of the six games he’s played in this season, including strong showings against Kansas and North Carolina. He’s expected to return to IU’s lineup very soon after suffering an ankle injury against the Tar Heels. The Jefferson City (Mo.) product won’t turn 20 until next July and is viewed as a consensus first round pick with three of the four projections we’re tracking slotting him as a potential lottery pick. Expert analysis: “Anunoby has been drawing raves from scouts all fall thanks to his chiseled frame (featuring enormous thighs). Now he’s supposed to be making the transition from defensive specialist to two-way wing with NBA 3-and-D potential. So far, pretty good. Against Kansas, not only did he shut down Josh Jackson, but he showed he could score with efficiency, hitting three 3s in seven attempts.” – Chad Ford of ESPN Insider. Notes: Defenses are keying more on Bryant this season, which is making it tougher for him to get clean looks in the post. He’s already made six 3-pointers this season after making just five all of last season. This season, the biggest strength of Bryant’s game has been getting to the free throw line. His free throw rate (FTA/FGA) is 80.7 percent, which is 26th in the country. And he’s making 78 percent from the line. He’s also improved his block percentage by 2.5 percent through nine games, an encouraging sign that he’s growing as a defender. Expert analysis: “Bryant’s stock will rise if he continues to prove he can reliably shoot from the perimeter. He’s a 6-10 forward who is averaging 11.9 points and 8.4 rebounds while shooting 37.5 percent from 3-point range.” – Gary Parrish of CBS Sports. Notes: There’s not much buzz surrounding Blackmon Jr., who will turn 22 in April, amongst those who cover the draft year round. Still, we’ve included him here because he’s looked seriously at the draft process the last two springs. He’s been impressive this season against the best competition Indiana has faced. In games against Kansas and North Carolina, Blackmon Jr. has an effective field goal percentage of 58, which is higher than his overall season average to-date. OG and TB are most likely lottery picks by the end of the year, especially if we go far in the tournament. JBJ on the other hand, has fallen off of draft boards this year and I feel badly for him because this is without a doubt his best year in candy stripes. He is more of a leader, is much improved defensively and I think he is making better decisions with the ball when he drives the lane. He is still explosive after all of the knee injuries and unlike his freshman year, he is playing better against better competition and not just getting his stats from overpowering weaker teams. I know that his injuries play a part in his draft stock, but I also feel that it is mostly to do with potential. The NBA just loves to draft freshman. Every draft board’s top ten is loaded with freshman and many of them really haven’t played as well as the veterans on their own teams. I will never understand it, but it makes me feel bad for JBJ knowing that he has worked so hard to reach his dream. Not to mention the unwarranted criticism he gets from some Hoosiers this season in the midst of his best, most complete season to date. If JBJ can stay healthy I believe he will play in the NBA. Too good of a shooter from outside to not attract some looks. I know I’m referencing another IU guy here but if you watch what Eric Gordon is doing for the Rockets right now… Gordon is not that strong defensively but he provides instant scoring off the bench. I could see JBJ being a version of that. How are scouts not interested in a guard who’s averaging 17 points and 7 rebounds a game??? James is easily our best player. I don’t see why he isn’t AT LEAST a top 30 pick. EG is a pretty good defender. i’d say it’s health concerns first and foremost, his actual game a distant 2nd. an 82 game season takes its toll even on those who are in optimal health. There is always a place in the NBA for 3 point shooting specialists. JBJ can get there if he proves he can stay healthy. Supply and demand? More guys 6’4″ that can shoot versus players 6’8″ that can shoot and defend at an elite level like OG. Both are good rebounders I’d say. I like James and appreciate what he brings to our squad, but he is not IU’s best player. TB and OG are ahead of him in that category. You are right about draft boards being loaded with freshmen. Unfortunately many times the guys who stick around (see, Tyler Ulis vs. Yogi 2016 draft) get punished in the draft for being older, accomplished players with a big sample size that reveals both strengths and weaknesses. I won’t be surprised if after choosing to stay another year, TB is a considerably later draft pick this year (assuming he leaves IU). The more these “experts” have time to watch a player, the shine wears off the idea of “limitless potential” and the reality of flaws set in. Not from what I’ve seen. I mean he’s no James Harden but defense isn’t one of his strengths. All I want is for Thomas Bryant and OG Anunoby to be 3 or 4 year players. It would mean so much to me. You can keep my choo choo train and fire truck and football. Give them to other kids in need. I’ve been a really good boy this year. Your favorite cookies will be waiting when you get here. IF that can’t be worked out, maybe a 5 star 2017 big man to open his eyes to IU’s development program. Didn’t know that OG is 6′-10″! That’s fantastic! I’m don’t think Yogi was punished. He was never projected higher than bottom of the 2nd round. Staying works out for more guys than it hurts, imo, just look at Frank Kaminski. And Buddy Hield, and many others. But there have been plenty that left for NBA early, based on potential or a small sample size, who never panned out, or at least not to the level expected. I only use the Yogi vs. Ulis example since it is fresh in our minds. One guy had a long history of success, the other a small sample of moderate success, roughly the same size guy, but Ulis gets drafted high on potential. I can’t prove it and we will never know, but had Yogi left IU earlier he may have gotten drafted based on potential versus being considered “old” at 22 when he entered the draft. My man Sarge. You need to post more often bro. Averaging the most points (on the most shots) and swooping in to grab rebounds while not blocking out your own man (truth hurts) does not a best player make. Valuable player? Yes. But “best player” is pretty subjective. I think age and the idea of limitless potential is part of it but not always. Victor, Dramont Green are doing very well and AJ Hammonds was drafted 46th last year. If you are good the NBA will come calling no matter if you are a freshman or a senior. Some guys like the college game some just want to go to the NBA. I think TB is the later and will do well whenever he decides to go. I appreciate your sentiments, sarge. And I love JBJ. But don’t you think a player learns more from his critics than from his enablers? Maybe last year, but this year I don’t see anyone bashing JBJ in a way that’s not constructive. His future doesn’t have to be in pro ball. If he proves to be NBA material, I’ll be the first to celebrate. If not, then I appreciate his contributions and love for our program, and I hope he’ll be part of a championship team. This has been a rough 10 days for me. The weather here blows and no IU basketball. Darn shame!!!! Blowout Butler!!!! In a best player list, the only guy I’d have above JBJ at this point is OG and I still think JBJ is the most important piece of the jigsaw in how successful this team can be. We have no one who can match his offensive potency when he’s on his game and our ultimate success will depend on how consistently he can bring 20+ ppg down the stretch. You’re right, a week is a darn long time to wait just as the season is hotting up. I console myself with the thought that the boys are getting some valuable rest and recuperation. Keep warm! I’ve said for years “potential” has gotten a lot of GMs fired. Look at the NBA lottery and it’s the same teams, year after year. Those teams take guys with tons of potential, but those players need a few years to put it together. By the time they’re ready to be stars, they finish their rookie contracts and sign with some team that’s pretty good, leaving the teams that draft them (and their new GMs, because the original guy got canned when the team languished for the past three years,) looking to start over. Start with the fact that the yard stick used to measure him at 6’4″ might have been a scale model. He’s probably closer to 6’2 than 6’4, and if you’re that short the NBA expects you to be some combination of extremely athletic and/or a phenomenal ball handler and passer. Blackmon is a better-than-average athlete, but at his height that isn’t going to wow any NBA scouts and he’s not known for his point guard instincts. I doubt they see the rebounding translating to the next level when almost everyone on the floor will be bigger (and quicker) than he is. There aren’t many Russell Westbrooks roaming around racking up rebounds from the back court. Then add in things like his health as WhatsUp mentions and supply and demand that N71 said–why are you going to spend a precious draft pick on a guy like him when you can draft someone else and still have several guys like James to choose from in free agency? Best scorer? Yes. Best all-around player? Not only are you correct, I’m not certain he’s ahead of Johnson, either. I do see him in a Craig Hodges/Tim Legler type role being able to carve out a niche. … you mean like the Pacers taking a Myles Turner with tons of potential and very little experience? He’s sure filling up the stat sheets in less than 2 seasons. There are examples to fit any argument. For every undervalued guy that becomes a stud, like Myles Turner or Paul George, there are overvalued guys who don’t make immediate impacts (think Philadelphia 76er’s… pick a player) or Skal Labissiere. You might even be able to make an argument for Morgan. LOL, how about CuJo, as per time spent on the IU hardwood? Poor James; I hope he finds a way to channel our criticism into constructive energy. You know, I don’t really mean to be critical. I’ve been really impressed with his improvements this year. But when we’re talking about all-around, there are some weaknesses to his game that are hard to overlook. Physically EG could have been a linebacker.And he is very strong going to the basket. I have never seen Yogi as a NBA guy.He always had his great games when we lost.Could go to the basket but never really understood how to move with the ball to assist the rest of the team. I understand your point but I’ve had a face to face conversation. I’m 6’0 and he’s AT LEAST 3 inches taller than me.